Two very awesome bloggers have tagged Passages with awards! I just love these things! Michele from A Reader's Respite: She's probably gotten one of these already since she kinda gets around! Ha! Totally kidding! Maybe. Kim from iLax Studio: the only non-book blog I read daily (even if I am slack on comments). Great blog written by a great woman! Smash from Great Books and Fresh Coffee: her blog is relatively new to the block, but I know it's gonna be one of my favs for a long time. 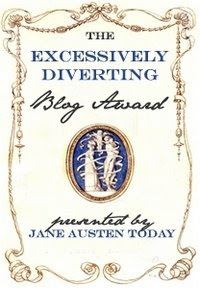 Miss Lucy from Enchanted by Josephine has tagged us with the Excessively Diverting Blog Award presented by Jane Austen Today! Miss Lucy, you do honor me! By the way, does Vinnie Lecalvier come as a prize? Ha! The aim of the Excessively Diverting Blog Award is to acknowledge writing excellence in the spirit of Jane Austen’s genius in amusing and delighting readers with her irony, humor, wit, and talent for keen observation. 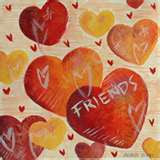 Recipients will uphold the highest standards in the art of the sparkling banter, witty repartee, and gentle reprove. Thank you, Amy, I am delighted!! Thank you! It's okay that you don't get over much (which isn't really true anyway!)... it's hard to stay caught up! oh these are all well deserved awards.Congratulations! Oh, Thanks Amy! You just perked my crappy day right up! ;o) I really love having readers and getting awards - thanks so much! I'll post it this afternoon. You are very welcome. I am reading Pride and Prejudice for the first time and your remarks about Austen are spot on.